A maze is great fun and it can be a maths learning experience too! 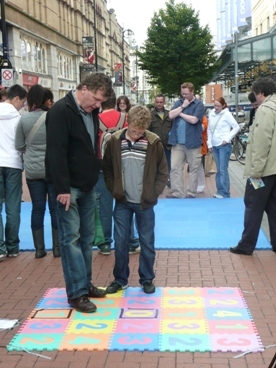 Mazes offer open ended problem solving for all ages in an imaginative and creative environment. 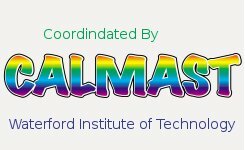 They develop mathematical logic skills and also require students to memorise quite lengthy sequences of moves in a particular order. Start at the black square with the "1" on it in the centre of the bottom row, and jump forward, sideways, or backwards, but never diagonally, the number of squares indicated by the number on the square. The objective is to find your way to the central square. It is not as easy as it looks. 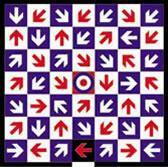 Starting at the arrow in the black square, find your way to the central target. Move any distance in the direction indicated. Whenever you stop, change direction as indicated by the arrow on whichyou land. Note this is a very difficult maze as there are 20 moves in the correct path! These mazes only allow right turns. (You are not allowed to turn around fully or go backwards). Here is one example and solution (below). Of course you can also make no right turn mazes. These mazes may be made in chalk in the playground or by many other ways. It could for instance be made with square bales of straw. A Maths Maze Day in your school offers the opportunity for students to develop creative maths problem solving skills. 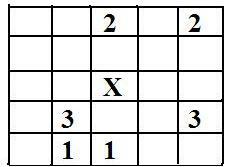 To complete this maze simply put other numbers into the blank squares on the grid. The level of complexity of the final maze depends on the position of the numbers on the grid. 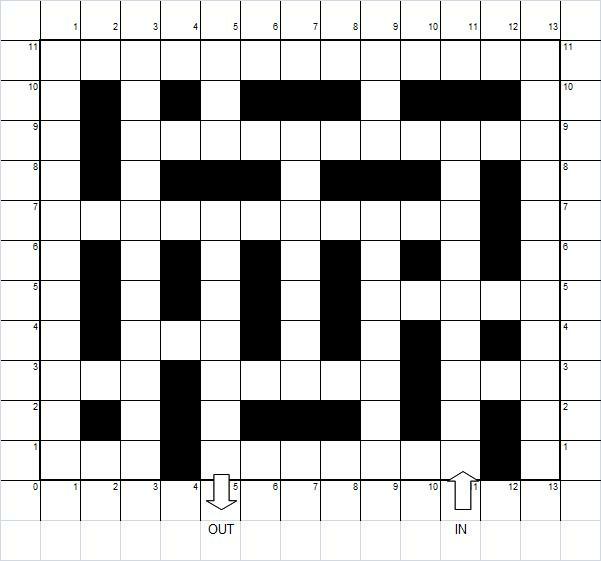 Most of the mazes that your students create will have a number of different solution routes to the final destination square. To create a unique solution path (only one way to the final destination square), none of the other numbers placed on the grid should allow you to “jump” onto the solution route. This offers a difficult yet very motivational challenge to students. Make sure when creating a maze that the path is not too short or your maze will be solved very quickly. Alternatively don't make the path too long, as you won't be able to have many choices or dead-ends, and then the maze becomes less of a challenge. Think carefully about the design and the way the maze looks; this will be important when it comes to getting others interested in playing your maze. 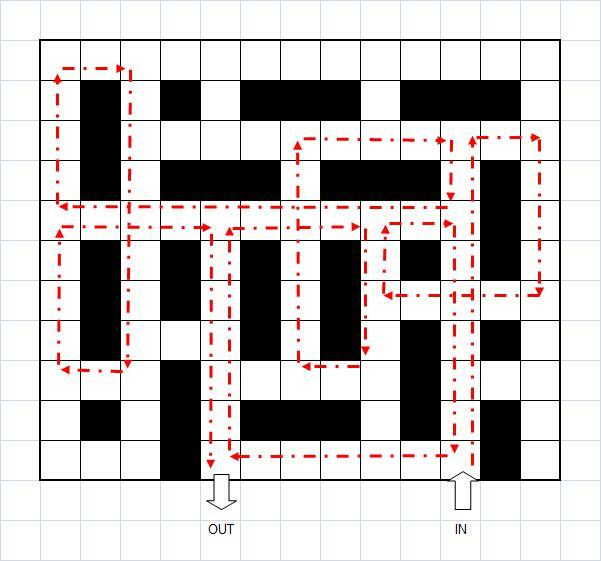 Here are some logic mazes you can show students before they start to design their own mazes. To motivate students it is a good idea to chalk mazes on the playground or to mark them out with tape in the school hall. Adrian Fisher is without question the worlds leading maze designer, and here presents a comprehensive, fascinating and fun account of the history of the maze that has an equally strong interactive element. This stunning volume will delight mass audiences everywhere. The book has a chapter on Mazes. Other chapters are on the maths of folk dancing, sundials, magic, castles, codes, number systems, and slide rules. Understanding the maths involved in mazes - Networks and Graph Theory – can get complex. If you wish to teach students some of this maths this book has accessible examples and exercises for 10 to 16 year olds. Its also has some really nice puzzles and problems.